The cucumber consumption has begun!! I think that I have been through at least a dozen cucumbers in the past week, because when it starts getting hot here, and believe me, that comes fast in the Deep South, I eat a lot of cucumber salads. Cucumbers are something like 95% water and they really do have a cooling effect on the body, so the phrase "cool as a cucumber" truly does have some meaning to it. They are surprisingly full of antioxidant vitamins also, help to rid the body of toxins and have many other health benefits. There are lots of different ways to make a cucumber salad of course, but I share a love for this very simple version with many Southerners, varying among us usually only by the division of ratios between the ingredients. One of our faithful readers, Sara, offered her mother's vinegar recipe so I used that as the backbone for my sour cream dressing and it was perfect for me. To make the vinegar version, I simply increase the white vinegar and sugar to 2/3 cup each, omit the sour cream and I like to use celery seed for that one in place of the dill, though either is good. As always, there are a number of multiple variations out there for the sour cream version, of course. Some folks, like me, like to add dill. Others like caraway or even celery seed, both of which are excellent add-ins. Some like the cucumbers very thinly sliced, others, like me, prefer this version with more chunky slices. Some use yellow onions while I find them too strong, and much prefer our beloved sweet Vidalias, and others prefer salad dressing (like Miracle Whip) or mayonnaise over sour cream, or some blend of them. One thing is for certain. Though you can get away with it on the basic vinegar salad, many cucumber salads are just going to taste flat and bland if you try to make them and consume them immediately. They really need a little time to meld and allow the flavors to soak in and marry well, and that is especially true with this sour cream version. 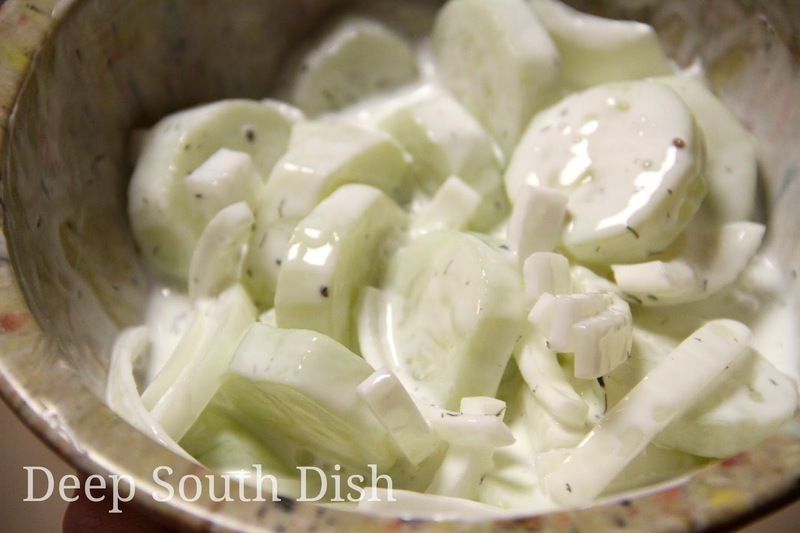 With all that water content, you aren't going to avoid the cucumbers creating a little water in the sour cream dressing as they rest, but the salting process does tend to help draw out at least some of the liquid and also flavors the cucumber nicely. Don't be fearful - much of the salt will drip away, although you can also use your salad spinner to help the process before adding the dressing. If you do omit the salting process, you'll want to add in some salt with your dressing. Peel cucumbers and slice about 1/2 inch thick. Add to a colander placed on a rimmed dish, toss with salt and let rest for at least 30 minutes, stirring occasionally. The salting will help to draw out some of the water, enhance the texture and help to remove bitterness that cucumbers sometimes have. For the dressing, whisk together the vinegar, sugar, sour cream, pepper and dill weed, if using. If I've got dill growing I use that, otherwise dried is fine too. Halve and slice the onions into thick slices, adding to the dressing with the cucumbers. Toss, cover tightly and store in refrigerator for several hours, or preferably overnight, before serving, until well chilled, stirring occasionally. Toss before serving. While you can get away with mixing up and serving the plain vinegar version right away, the sour cream version really does need this resting time so that the cucumbers absorb the flavors. To make the vinegar dressing for this version, I simply increase both the sugar and white vinegar to 2/3 cup each and I personally like to substitute celery seed for the dill in this one. Peel cucumbers and slice about 1/2 inch thick. Add to a colander placed on a rimmed dish, toss with salt and let rest for at least 30 minutes to draw out some of the water. For the dressing, whisk together the vinegar, sugar, sour cream, pepper and dill weed, if using. Halve and slice the onions into thick slices, adding to the dressing with the cucumbers. Toss, cover tightly and store in refrigerator for several hours, or preferably overnight, before serving, until well chilled, stirring occasionally. Tip: After the salting step, run the cucumbers through your salad spinner to spin off any remaining moisture and salt before proceeding with the recipe. Cook's Notes: Substitute mayonnaise, Greek yogurt or buttermilk (use half) for the sour cream if you prefer. Don't expect to mix this up and then consume it immediately, or you will have a bland, tasteless salad. It really needs time to mellow and allow the flavors to soak in, and that means letting it sit overnight in the fridge, or at very least, 2 to 3 hours. If you omit the salting step, taste and add salt as needed. 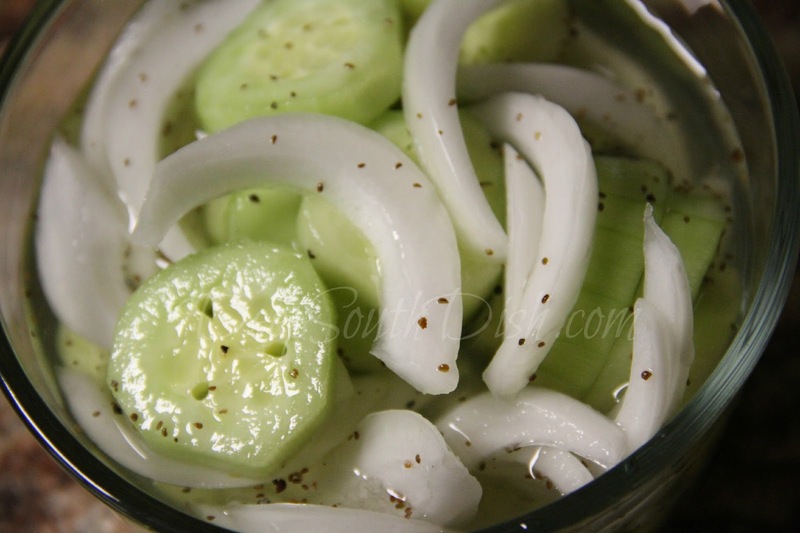 Cucumber and Onion Vinegar Salad: Increase the vinegar and sugar to 2/3 cup each and omit the sour cream. I like to use celery seed instead of dill in this version. Can't wait to make this one! It's not quite cuke weather here yet (mid-Atlantic) but it's around the corner! also wanted to tell you I made a couple of your dishes in the past week - your brownies and the skillet asparagus - and my husband (and I!) LOVED them - he doesn't usually rave, but he sure does love your recipes!! Going to make your Comeback Sauce, the strawberry spinach salad, the sloppy joes and the meatloaf in the next week! Aw Amy, that sure makes my heart happy - thank you so much!! This one is good but I prefer the one that I make where I add red wine vinegar and tomatos. Add the vinegar to taste with salt and pepper. Mix mayo or sour cream, red wine vinegar, salt and pepper. Hi Vickie! This is just a basic cucumber and onion salad with a mayo & vinegar dressing, but of course, you can use whatever vinegar you like and you can absolutely add in tomatoes! I love all kinds of cucumber salads and in fact, I have a number of them shared right here on my blog. Thanks for also sharing your version with our readers also! As soon as our cukes come in here in central Virginia I'm making this recipe. Love salads using fresh vegetables from the garden. I have cucumbers on the vine now in N. La. Should be ready to pick in about a week and I am definitely making this salad. I love this over the top of boiled buttered potatoes. I have always used mayo instead of the sour cream because of lactose intolerance issues. It's so cold here yet in Wisconsin, it'll be a while before we get fresh cucumbers. Aren't those potatoes so good!! They really are over the top. It'll be a bit for homegrown cukes here too, but we are definitely blessed with a very long growing season in the South for sure - and I am grateful for it!! Well, we are just now planting gardens, so by the end middle of the summer, this will be GREAT! It sounds so refreshing. Cucumbers and iced tea hold me over through these hot summers here - this is a favorite for sure! So glad you enjoyed it too Val & thanks so much for taking the time to let me know. I've decided this summer to try every one of your recipes as you post them. I'm already behind as I just did this one and have two more to "catch up" since you just posted a new one tonight. Although I guess I could just make all three at once and have a "three salad supper." Aw that's so cool & what a vote of confidence - thanks!! Made this for a picnic near the pool and my Family raved....thank you it was so very Yummy, Refreshing and healthy too!! I'm so glad y'all enjoyed it. I've lost count on the number of times that I've made it already this summer. Whew, it is HOT! Hi Mary - My Mom made cucumber/onion salad with ice water and ice cubs to cover which she placed in the "ice box" for 24 hours. I think she used vinegar but no sugar because I don't remember it being sweet. She drained it to serve and if there were any leftovers (unlikely) she repeated the ice bath. This was such a refreshing salad and it lasted for days. It was also my Dad's favorite salad, so I remember it with especial fondness. Have you ever heard about a salad like this? I have! Sounds like your Mom was making a basic cucumber refrigerator salad! Some people use sugar, some don't, or at least very little - just depends on how tart you like it! Anyway, you basically put your sliced cucumbers in a bowl in layers with salt, top with crushed or chopped ice and pour about 1/4 to /2 cup of vinegar over the top - depending on how many cucumbers & how large. Add enough water to just cover the salad and refrigerate 24 hours. The ice & ice water crisps up the cucumbers. Hope that helps! Thanks! I'll try it this weekend. I like to add a little bacon and avocado to mine it is delicious. Grandmaw use to make something like this too, it may had some dill, might also have been made with plain yogurt and was chill then everybody for spoon it over stewed taters. I absolutely love this cucumber salad recipe. My honey doesn't like cucumbers....more for me! I used dill in my recipe, which was delicious. This is my late-night TV snack! !